The birds are chirping, grass is growing, and winter is making its final farewell, it’s finally spring! It’s time to store away those winter boots, the same winter boots that have been walking all over your beautiful floors all season long through the long, dirty, cold, and unforgiving months of winter. Winter not only pummels the outdoors, but mud, snow, and salt is tracked all over your home, leaving a mess on your floors. With spring comes everyone’s favorite spring time activity, spring cleaning. 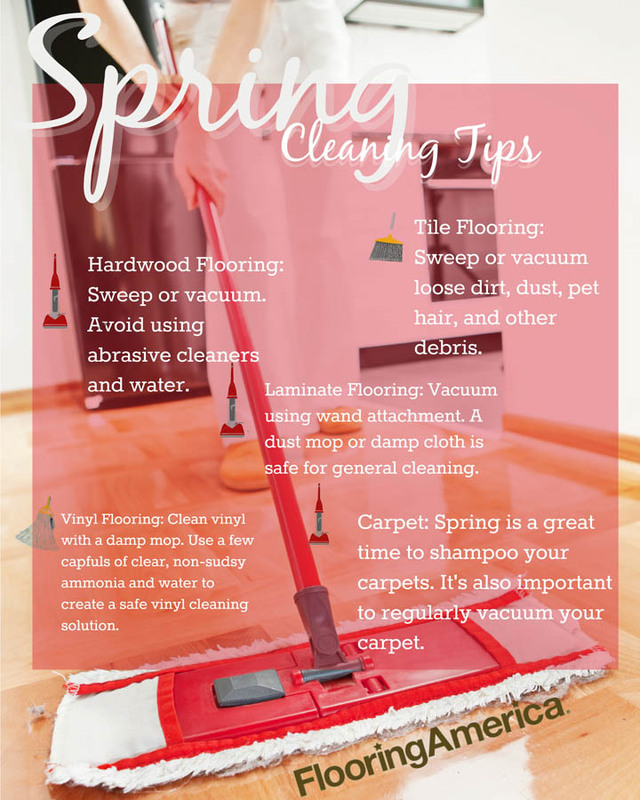 Here are some spring cleanings tips to get your floors back in tip-top shape. When it comes to tile flooring, the first step to cleaning them is to sweep or vacuum loose dirt, dust, pet hair, and other debris. Ceramic tiles only need warm water to properly clean them, but you can also seek out a manufacturer recommended cleaner. It’s sometimes best to avoid using a sponge mop as a mop can push dirt into the grout tracks of the flow. Hardwood flooring can be cleaned by sweeping or vacuuming. It’s important to never use abrasive cleaning products on your hardwood floor to avoid scratching and gouging. Check with the manufacturer of your hardwood floor for recommended cleaners. For more general hardwood flooring care, check out our Flooring Guide. Vinyl flooring can be cleaned by occasional mopping. It is recommended to find a manufacturer’s recommended cleaner to remove dirt built up. A few capfuls of clear, non-sudsy ammonia and water is a safe cleaning solution that you can use when spring cleaning vinyl flooring. When cleaning laminate floors, it’s best to vacuum the floor using the wand attachment. Use a dust mop or damp cloth for general cleaning. It’s important to wipe up wet areas an allow them to properly dry, as laminate flooring can be extra slippery when being cleaned. If winter has left traces of salt on your floor, use a damp cloth to wipe the stain off. Spring is often the best time to shampoo your carpets. It’s important to hire a professional service if you’re unsure of proper carpet cleaning techniques. Vacuuming is also extremely important to help remove dirt and grime that may have become trapped in your carpet’s fibers. When you’re ready to spring clean your floors, don’t forget you can reach out to Flooring Canada for any questions regarding recommended cleaning products.